Automated financial advisors are making in-roads into the wealth management business. In 2014, they were estimated to have at least $14 billion in global assets under management. Within the next five years, that number is expected to swell to $255 billion. That number is still only a fraction of the $17 trillion in assets managed by U.S. wealth advisors; but as technology develops, baby boomers retire in droves, and millennials grow into roles where they are investing money, the use of these so called “robo-advisors” is expected to grow significantly. If the robo-advisors merely take a small slice of the $17 trillion pie, they will have a large business opportunity. Most of the technology in the field is innovative and developing. Innovators developing the technology should be aware of federal and state tax credits that are available to stimulate the efforts driving the technology and shoulder the costs of research and development. One recurring theme of the past century has been the acceleration of automated technologies augmenting human workers’ performances. The financial services industry is no exception. As baby boomers retire and save away cash for retirement, the demand for investment advisors continues to grow. The Bureau of Labor Statistics estimates that this field will grow by about 27% through 2022. This figure is nearly three times larger than the average projections among all occupations, which is 11%. Besides the supply-side problems in the workforce, there are also significant demand-side issues from customers who have money to invest but not enough to attract the attention of high profile advisors. Indeed, given the amount of time and resources it takes to properly evaluate each client, the best advisers typically won’t take on a client unless they are drawing fees from a $500,000 to $1,000,000 portfolio. These professionals, trying to keep pace with demand and others trying to capitalize on the underserved market of those with less than $500,000 in assets, are turning toward automation for assistance. A survey of 11 leading robo-advisors by consulting firm, Corporate Insight, finds that total assets managed by the firms rose 65 percent from March to April 2014, hitting $19 billion in December . This is in line with the recent trend of investors searching for low cost investment advice. The range of services offered by automated technology varies from company to company and generally includes investment advising, basic advice, account aggregation, risk assessment, financial planning, re-balancing and even tax optimization. Ultimately, the advent of the robo-advisors means empowerment for the basic investor who, instead of turning to traditional financial advisors, will turn to an algorithm warehouse that will generate an appropriate investment strategy based on inputs from the user. However, to describe the technology as such would be an over-simplification of the process. The section below demonstrates the intricacies and innovations involved with the service. The technology involved in creating a robo-advisor is cutting-edge. Computers do not just collect data and process information; they draw inferences, answer questions, recommend actions and display data in visual layouts with state-of-the-art features. It is somewhat analogous to IBM’s Watson program which combines data exploration and content analytics capabilities to allow users to make ad hoc queries for broad topic searches and explore the full scope of content for unique insights. With the service, small investors with as little as $5,000 will be able to open individual, joint, IRA and revocable living trust accounts with automated portfolios that use Schwab and other ETFs. The suggested portfolio presented to the user depends partly on investors' answers to a half dozen questions aimed at gauging their tolerance for the ups and downs of financial markets. The chart below on the following page demonstrates a typical portfolio developed by a Schwab robo-advisor. The computer generated portfolios include up to 20 asset classes across stocks, fixed income, real estate and commodities, as well as an FDIC-insured cash component—so they’re truly diversified. After the ETFs are chosen, the experts at Schwab monitor their performance on an ongoing basis to make sure the ETFs continue to provide consistency and diversity. Allowing the computer to do the leg work while the human constantly monitors performance provides real value for the investor whose portfolio will benefit from the significant cost savings due to the lack of fees. 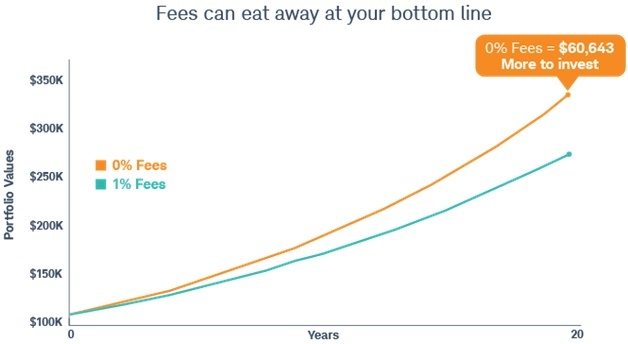 The chart below demonstrates how fees can significantly eat away at a customer’s bottom line. What’s more is that the robo-advisor’s ability to constantly rebalance the portfolio significantly reduces risk. With any portfolio, natural market fluctuations increase and decrease the value of holdings, causing asset allocation to stray from its target. When that happens, it’s time to rebalance by buying underweight and selling overweight asset classes. This rebalancing is critical to successful investing. Keeping investments consistent with selected risk profile increases the potential for growth and reduces volatility over time. These daily check-ins are all part of the service for those whom maintain just a $5,000 investment portfolio. This type of automated service allows the human overseer to manage a large number of portfolios and provide quality service for a fraction of the cost. It is this type of human/robot collaboration that is expected to drive down costs and increase quality investments. Other innovative companies have similar visions as well. Warren currently has the capacity to answer more than 65 million similar question combinations in a few seconds by scanning over 100,000 detailed, recent economic events such as fluctuating interest rates, corporate mergers, political unrest, awarded patents and their potential impact on nearly every financial asset world-wide. This is not the traditional ETF investing and algorithm based, trend analysis provided by computer’s of the 90’s. The user of the software types questions into a Google-style search box. The computer then instantly generates a detailed answer in a matter of seconds that would traditionally take several analysts several days. It basically provides the user with an army of analysts at his finger tips. The fundamental idea behind the Warren is that by providing financial modeling and analysis software through the cloud, an analyst can utilize cutting-edge supercomputing capabilities to generate detailed analysis that previously required a team of highly specialized “quaints” to deliver for a large cost outlay. A task that would previously require fifteen analysts making six figures two weeks, can now be done in five minutes by the software. The only expertise required is the ability to ask the right question. But the self-learning machine may soon develop that ability as well. Kensho CEO, Daniel Nadler, had this to say about the potential of the self-learning machine, "The next step is literally a financial analyst on Wall Street – or for that matter a retail investor – will turn on their computer in the morning, and they are going to have an intelligent assistant in that computer that says, 'Good morning Matt. It's 9:35 in New York City. You may or may not know that the jobs report just came out this morning at 8:30, and there was a big downside surprise. We lost 35,000 jobs more than the consensus. You should expect these 15 stocks to be most directly affected by this over the course of the day.” Nadler expects this capability to come within the next two or three years. Industry leaders have faith in the technology as well. Goldman Sachs recently invested $15 million in the start-up last November. Seven out of ten of the top quantitative funds on Wall Street have access to the technology. To Kensho though, acceptance by large investors is not enough. They hope to bring the technology to the average investor as well. Nadler had this to say about bringing the technology to the masses for a reasonable price, "Our belief is that people should be entitled to outperform the market, but people should not outperform the market because they can buy a technology that no one else has." Other innovative companies have similar initiatives as well. Australia based bank, ANZ, provides financial products and services to around 9 million customers worldwide, employing about 49,000 people. They are currently working with IBM to automate call centers using the innovative Watson Engagement Advisor software. The “Ask Watson” feature built into the program allows customers to ask questions, provides feedback and guides purchase decisions. ANZ is developing the partnership in order to help bank advisors better serve their two million wealth management clients. A key issue in the wealth management industry is that customers often lack the expertise and technical rhetoric to ask the right questions in the first place. An influx of new financial solutions is being brought to the market every day. It’s hard for customers to be aware of insights that would prompt them to ask relevant questions even if they did have the technical expertise in the first place. ANZ envisions an industry where automated financial advisors will have access to everything they need to know about each customer’s portfolio including their risk appetite, upcoming retirement, and suitable option alternatives across broad spectrums of the market. The software will empower their advisors to be smarter and faster by leveraging a groundbreaking innovation that can think like a human, and serve as a dedicated assistant, researcher and guidepost for ANZ’s top-flight team of human advisors who will work hand and hand with the robots. Bridgewater Associates, the world’s largest hedge fund manager with $165 billion under management, is turning towards artificial intelligence. This past month (March 2015) the firm started a new artificial-intelligence unit with about half a dozen people led by David Ferrucci, the all-star engineer from International Business Machines Corp that developed the Watson computer to beat human players on “Jeopardy” during his time there. The unit is tasked with creating algorithms to make predictions based on historical data and probabilities. But the technology (which is still rather confidential) is far more innovative than its ancestors from the late 1990’s who used quantitative analysis to predict similar trends. The difference is that the latest technology has self-learning capabilities, can communicate with humans and is capable of analyzing far more complex and voluminous data. As opposed to following static instructions, programs learn as markets change and adjust to new and forthcoming information. The programs are effective, advocates say, because they can crunch huge amounts of data in short periods, "learn" what works, and adjust their strategies on the fly. In contrast, the typical quantitative approach may employ a single strategy or even a combination of strategies at once, but may not move between them or modify them based on what the program determines works best. Renaissance Technologies, the East Setauket, NY investment management company with headquarters near Stony Brook University and operations in Manhattan, has been developing innovative self-learning financial analysis technology as well. The company was founded in 1982 by President and CEO James H. Simmons and has over $22 Billion in assets under management. It has consistently been a leader in cutting-edge financial management technology around the world, employing complex mathematical models to analyze and execute trades, many of them automated. The machine learning technique at Renaissance is designed to mimic the computer trader’s human counterpart investors. Perhaps the largest player in the artificial intelligence game though is the historic stalwart IBM with their Watson Engagement Advisor. The Watson Engagement Advisor is somewhat of a financial analyst version of its 2011 ancestor that won the TV show Jeopardy! against human champions Brad Rutter and Ken Jennings . IBM’s cognitive computing systems, like Watson, are capable of understanding the subtleties, idiosyncrasies, idioms and nuance of human language by mimicking how humans reason and process information. Michael Rhodin, head of Watson Group had this to say about the technology "It reads. When it reads a lot, it adapts and learns. It gets smarter. When you ask it questions, it will generate hypotheses—potential answers—with a degree of confidence." The Watson Engagement Advisor automates customer interaction by fielding questions in natural language with informed, evidence-based reasoning. The ability to take context into account during the hypothesis generation and scoring phases of the processing pipeline allows Watson to address these complex financial services problems and assist financial service professionals in making better decisions. Financial services are the “next big one for us,” said Manoj Saxena, the man responsible for finding Watson work. IBM is confident that with a little training, the quiz-show star that can read and understand 200 million pages in three seconds can make money for IBM by helping financial firms identify risks, rewards and customer needs that mere human experts may overlook. Watson can comb 10-K reports, prospectuses, loan performances, and earnings quality while also uncovering sentiment and news not in the usual metrics before offering securities portfolio recommendations. It can also monitor trading, news sources and Facebook to help a treasurer manage foreign exchange risk. In addition, developers are aiming not only to deliver the technology to high rolling investment bankers but to average citizens as well. The real benefit in utilizing the technology lies in the computer’s ability to analyze and sort through a massive amount of information commonly called Big Data . With the introduction and growing plethora of Big Data, human traders simply do not have the time or the resources to do what a computer can do for a fraction of the price, in a fraction of the time and with pinpoint accuracy. The most innovative automated wealth advisors are more than just user friendly versions of the quantitative turn-key asset management programs that financial managers have been using for years. Cognitive computing allows automated advisors to interact with investors on their terms. The artificial intelligence systems can reason, learn, and communicate with humans on fact specific and detailed issues. With this, they are able to make instant portfolio adjustments based on certain customer specifics such as the birth of a new child or grandchild, the formation for a new business or a meaningful charitable contribution. Without the technology, financial services firms face extreme challenges in sorting through massive amounts of data. The amount of information that comes to an investment firm on any given day is enormous. Reuters publishes 9,000 pages of financial news every day. A typical financial service professional receives hundreds of e-mails on an average workday. Firms have access to data about millions of transactions that simply cannot be perused by even a large number of human workers. 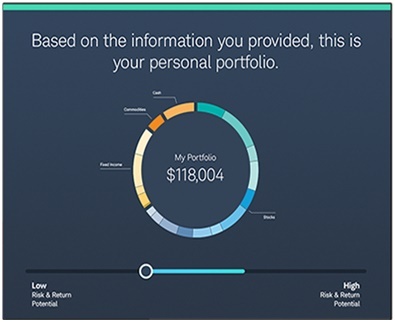 Moreover, the robo-advisors have the ability to select appropriate portfolios for individual investors. Robo-advisers typically prompt the customer to fill out an online questionnaire. They then use software to generate and monitor a portfolio of exchange-traded funds that is narrowly tailored to the customer’s risk preferences provided in the questionnaire. They are particularly useful for investors who prefer to rely on historical trends and quantifiable market factors. The upside is that humans typically charge a lot more for their services while the robots can do precise risk analysis for a fraction of the cost. They are particularly useful in bear markets where even small service charges can eat significantly into yields. With treasury bonds yielding 2% annually, the cost of human advice could mean up to half of expected returns. The most practical use of the software, however, will likely involve passive investment decisions in mutual funds, index funds, or ETFs. These type of investments are often far more cost efficient and typically more effective in generating yields as well. One cornerstone of modern financial theory involves the “efficient market hypothesis”. Basically, this investment theory states that it is impossible to beat the market because stock market efficiency causes market prices to always incorporate all relevant information. Advocates of the theory argue that it is pointless to search for undervalued financial assets or to predict trends in the market through technical analysis. The theory seems to have particular merit since professional investors routinely underperform amateurs who simply buy an index fund designed to track a broad market index. Given the lack of consistency in the ability of human investors to predict trends and the typical outperformance of professionals by indexes, it seems that the robo-advisors who will be used typically to pick an index will be the perfect fit for small time investors who will more often than not make more money with this approach. Vanguard, the world’s largest mutual fund with over $3 trillion in global assets under management, is currently testing an advisor service that combines aspects of web-based advice and investment-modeling algorithms. The service, Vanguard Personal Advisor Services, is still just a pilot program that has not officially been rolled out and offered to the general public, however, assets in the unit reached $10.1 billion at the end of 2014, up from $755 million in 2013, according to the firm. Vanguard expects to release the virtual service to the general public later this year. The service combines input from both a “robot” and a human in the form of a salaried advisor. It is this kind of hybrid approach that is expected to gain more acceptance in the financial industry in the not so distant future. The University of Tennessee Space Institute offers coursework in facial biometrics, a technology that identifies faces and picks up on non-verbal communication cues. The most innovative software is developing the ability to measure human emotion through facial movements using a webcam. Repeated interactions with repeat customers are stored within the computer and used to generate a profile on each individual customer. The technology is typically used in advertising in order to assist marketers in evaluating their video ads. Financial advisors may soon start using the technology to give investors a personalized service. Already, human-like images and comic avatar faces are being used in customer service settings to help customers pay bills or withdraw money from an ATM. Pretty soon, the same faces and avatars will be engaging with investors, carrying on a full-scale conversation and responding to non-verbal forms of communication. Automated, artificial intelligence based systems are beginning to support wealth management advisors. In this industry, artificial intelligence can reduce non-value added high costs and help the average investor obtain an advanced economic edge. Federal and state R&D Tax credits are available to stimulate the efforts in robo-advisor innovation.